No one likes court cases (except lawyers!). In America, there are two specific types of cases that can be brought against you… and neither of them are fun to deal with. 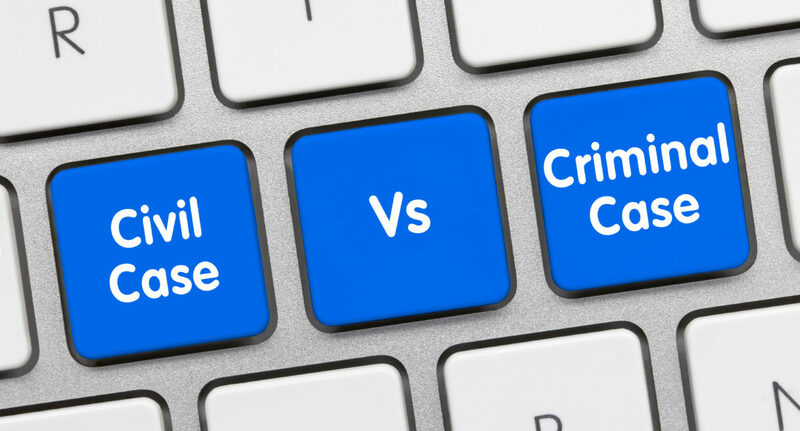 While there are some overlapping cases between the two, criminal and civil cases can usually be identified fairly easily. Criminal cases involve crimes that are offensive to the state or society and typically have a jury trial. In this case, the state prosecutes the party (instead of someone specific). Criminal cases tend to be harder to prove because of the greater consequences of a guilty conviction – which, most of the time, is jail. They must be proven “beyond a reasonable doubt,” and if the person can’t afford to appoint an attorney themselves, they are provided one by the state. Some criminal cases might be murder, assault, DUI, theft, kidnapping, and more. In civil cases, the wronged party files a case against the other party (that state does not do it for them). For the most part, the civil case guilty party is subject to fines tied to their sentence, and may incorporate an order to do something specific. Obviously, the punishments are less harsh in these cases, because they do not usually represent something extreme. Most of these cases are ruled by a judge rather than a jury, and a guilty sentence must be found from proof that shows that it was more than likely something happened the way it did. Also with civil cases, defendants must represent themselves in court or pay for an attorney. Civil cases might me breach of contract, defamation, negligence, property damage, medical malpractice, fraud, and more. Sometimes it can be difficult to decide what kind of a case something is – or a case might be both at the same time. This is why it’s incredibly important for you to talk to an attorney if you’ve been charged. Getting a criminal defense attorney can help ensure you are properly represented in court and protect your rights throughout the case. If you need help with your case, call Tad Morlan as soon as possible. (Next Entry) Do I have a Medical Malpractice Case?